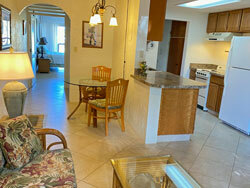 Beautiful tropical garden and newly remodeled pool on-site with views from living room. 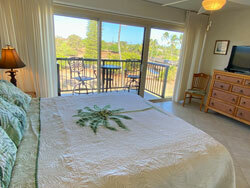 Bedroom and Lanai offer great ocean views, park view, mountain views and sunrise views! 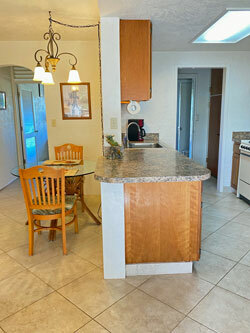 Our condo can be your home base for many Kauai adventures. 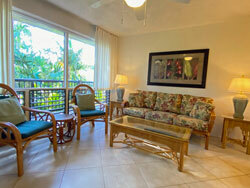 With the ocean just 20 yards from the resort; swimming, dolphin and whale watching, and surfing are just steps away. Our large 720 sq. ft. condo is ideally located in the middle of the resort, and the third floor location opens it to the refreshing trade breezes and lovely ocean, mountain, park and sunrise views. This elevated vantage point (sorry, there is no elevator) gives you a commanding view of the Pacific Ocean.You can hear the ocean from the bedroom at night! The lovely beach next to the toney Beach House Restaurant, just a short walk down the street, has some of the best snorkeling on the island with the amazing and gentle Kauai Green Turtles as occasional guests. Also within convenient walking distance are the National Tropical Botanical Gardens, the famous Spouting Horn, Whaler's Cove, and an upscale Hawaiian style shopping mall with an impressive set of great restaurants. And it's just a short drive to world famous Poipu Beach and old Koloa town. Come home at the end of the day to relax in your living room with lovely Hawaiian style furniture and tropical garden and pool views. Prepare a meal in your fully equipped kitchen or make use of the barbeque area with grills and picnic tables near the pool or eat at one of the nearby restaurants. 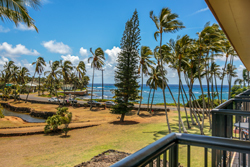 Lay back in your comfortable king size bed and enjoy ocean and mountain views as you over-look Prince Kuhio Park, Hawaiian sacred ground, from your bedroom or lanai (deck). The island has everything you could want from amazing helicopter or ATV rides, hiking Waimea Canyon, the "Grand Canyon of the Pacific", or the spectacular Na Pali Coast, renting surf boards or horseback riding. 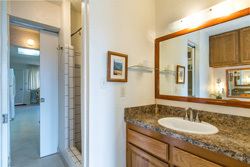 Our Prince Kuhio one bedroom, one bath condo is value priced and ready to host you for a relaxing time or for your Kauai adventures.